Generations of new and improved macerators have been installed by generations of service engineers. The Saniaccess is the first in a range of easy access macerators designed for new installations in domestic and commercial premises with light use. Ideal for guest house en-suites, small shops and offices where business continuity is essential. This new generation of macerators enables fast, clean and efficient service and maintenance of the product whilst still installed. There are four different products in the Saniaccess range. The Saniaccess 3 is suited for complete shower rooms. 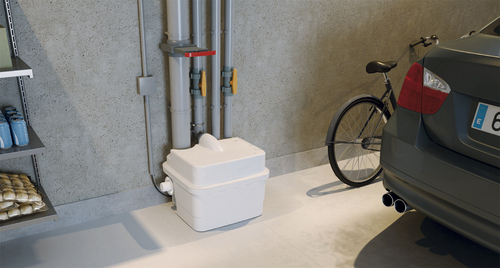 The Saniaccess 4 is suited for complete bathrooms and Kitchens. The new Sanicubic 1 from Saniflo!